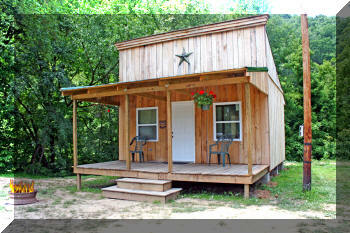 The 16'X18' cabin has an 8'X16' covered front porch. It will sleep 6 people in two bedrooms. The larger bedroom has twin size bunk beds and one full size bed. The other bedroom has twin size bunk beds. Sheets and country quilts are provided. The bathroom has a 4' walk-in shower stall supplied by an eighty gallon hot water tank. Towels are provided. The kitchen area has a table, refrigerator, microwave, toaster, and coffee maker w/complimentary coffee. There is a fire ring out front for the true camping experience.